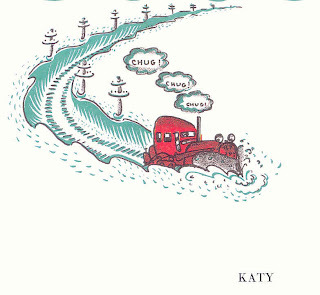 Practice in Time: Katy and the Big Snow! After a week in sunny Florida (plus a couple extra days due to our Saturday flight being cancelled from the first storm) we got home to a dose of reality, Pennsylvania-style. With yesterday's 2+ ft on top of the Saturday storm we have about three feet of snow on the ground. This is one of the top three snowstorms I've ever experienced in my life. I think my kids believe that this is what winter is always like, and they're having a ball. The adults, on the other hand, know better. DH spent most of last night trying to plow our driveway out and I spent all morning finshing the shovel work. Not to mention trying to keep a 5- and 2-year-old safe and warm (and out of drifts that go over their heads) while I'm working. My arms are sore, I'm exhausted and I barely even dug out my car! 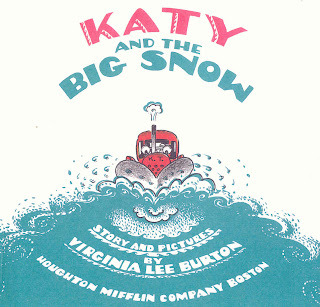 So there's nothing better after all that than to curl up with a cup of cocoa, two little snugglers and the classic 1943 book, Virginia Lee Burton's Katy and the Big Snow. I am a big fan of vintage children's books- mostly because they tap into that realm of a kid's imagination without any of the modern distractions. They allow my kids to form a bond with the same memory associations I have with this book, and that my parents' generation has. The story and the illustrations are iconic, and very distinctive. When we read it, my kids are no different from those kids in 1943 that imagined themselves helping Katy plow out the city of Geopolis. And that's the way I like it.